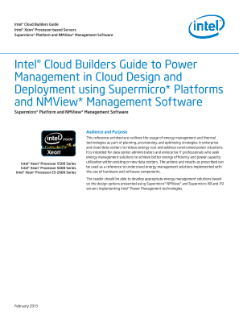 This reference architecture outlines the usage of energy management and thermal technologies as part of planning, provisioning, and optimizing strategies in enterprise and cloud data centers to reduce energy cost and address constrained power situations. It is intended for data center administrators and enterprise IT professionals who seek energy management solutions to achieve better energy ...efficiency and power capacity utilization within existing or new data centers. The actions and results as prescribed can be used as a reference to understand energy management solutions implemented with the use of hardware and software components.